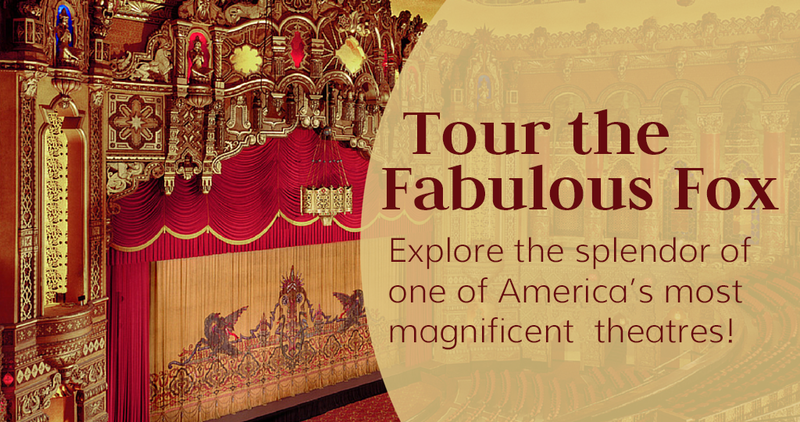 Experience history and go behind the scenes of the Fabulous Fox Theatre! There will not be a public tour on Saturday, April 20. Please join us at another time. Tours of the Fabulous Fox Theatre are conducted every Tuesday, Thursday, and Saturday at 10:30am (except holidays or when a private event is scheduled). Tickets are available at the Fabulous Fox Theatre Box Office beginning at 10am. These tours begin from our Box Office located directly north of the front brass doors. Each tour lasts approximately 1 ½ hours. Your tour will include a visit to, “A Tribute to Stan Kann,” located on the 4th floor of the theatre. Stan Kann was the Fabulous Fox Theatre organist for decades. On this floor you will also find “Peacock Alley”, which provides a photographic montage of the fabulous entertainers and productions that have played the Fabulous Fox since its reopening in 1982. When a show is not appearing on the Fabulous Fox stage, your tour will also include a look at our backstage area, including access to the stage. Saturday public tours include an organ presentation at one of the two Wurlitzer organs located in the theatre. Guest organists include Jack Jenkins, Jack Moelmann and Dave Stephens. Private tours for groups of 20 or more can be arranged by contacting our Tour Department at [email protected] or at (314) 657-5068. An elegant plated or buffet lunch is available for groups of 25 or more people beginning at $18.95 plus tax and gratuity served in a private room of the theatre before or after your scheduled tour. Click here to see sample menus. For more details on hosting a luncheon tour, please contact Madeline Hantak at [email protected] or (314) 657-5051. Free parking is available for Fabulous Fox tours. The parking attendant in the lot behind the Fox Theatre on Washington Avenue will direct you to the appropriate parking location. While stairs are involved in visiting some areas of the theatre, elevators are available between all auditorium floors.